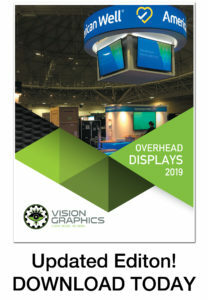 The Vision Graphics Overhead Displays catalog provides a complete lineup of display shapes, offered in any size that will fit your exhibit space. Overhead trade show displays help you take advantage of the whole space at your next trade show or convention. Vision Graphics will help you create a hanging banner or overhead display to help you draw more attention to your company’s brand, to make it easier for potential clients to find your booth, and to give you the visibility you need for the entire show. We offer custom design, quick turn-around and expertise on transport and assembly. Utilize our design resources or request a template for a specific shape and size. With one of our overhead structures, your company will be seen from every direction. Overhead structures are simple to assemble, lightweight, and virtually tool-free. No carpentry or construction skills needed! We understand the importance of getting the most out of your trade show display, and we want to help you succeed. Contact us to discuss your ideas and options.